Timeless and elegant, solitaire engagement rings feature a single center diamond to capture all the attention. A naked ring body in the precious metal of your choosing draws in light to enhance your diamond's sparkle. 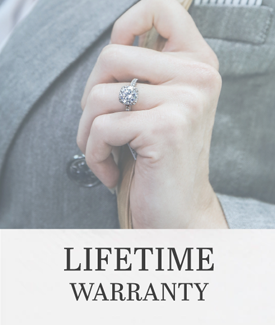 When it comes to engagement rings, there’s a reason that the classic solitaire ring has long been the gold standard. The look is timeless and undeniably elegant, making it a great choice for any woman. This design was made to let the center stone thrive as the center of attention. Icing On The Ring’s solitaire diamond rings come in a wide range of styles, varying from the simple and sleek to the elaborate and extravagant. Choose from this selection of stylish and sophisticated rings to find the perfect fit for that special someone in your life. Putting a little extra thought into your choice of engagement ring will help your entire proposal look more polished and refined. By going with one of these minimal engagement rings, you’ll show your appreciation for timeless style along with your consideration of your future spouse’s preferences. The solitaire is one of the most popular types of rings because it’s understated yet radiant appearance is ideal for everyday wear. Whether she’s dressing up for a fancy event or in her most casual attire, a solitaire ring will look right at home on her finger. Choose one of these rings for the poised and graceful woman you hope will become your wife. Though we welcome any customer to come visit us in person in the Los Angeles Jewelry District, you don’t have to live nearby to get the perfect ring for your proposal. At Icing On The Ring, it’s easy to shop online to find a lovely solitaire diamond ring. We offer a wide variety of ring designs from which to choose, including rose gold, yellow gold, and white gold rings. Our onsite artisans build each ring from scratch, so you can customize it with the specifications you prefer for the ring metal, center diamond shape, carat weight, ring size, or side diamond weight. Allow us to help bring your vision to life when you shop at Icing On The Ring for the perfect solitaire ring.